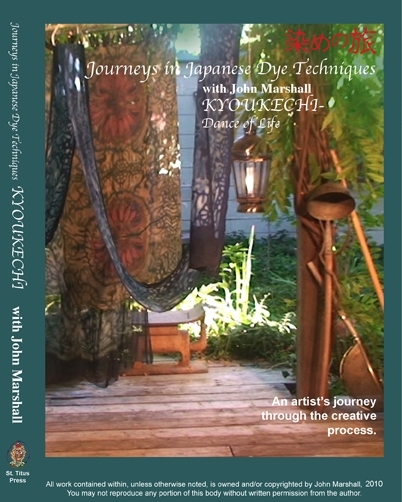 Journeys in Japanese Dye Techniques with John Marshall is a series of DVDs in movie format designed to bring you into one artists’s studio as he explores traditional Japanese dye and construction techniques. KYOUKECHI-Dance of Life is the first DVD in this series. Kyoukechi is an ancient and complex form of clamp resist practiced during the Heian period in Japan. We visit John’s studio in late summer in the remote hills of Mendocino County as he employs local materials to recreate a thousand-year-old process with his own original designs, making use of natural dyes on natural fibers. Click on the button above to pay via PayPal. If you are ordering multiple items, or live outside of California, your overpayment will be refunded once the order is shipped.